Ring looks amazing. One of my favorite pieces that i bought from Stauer. Goes with everything and looks a lot more expensive. Truth is, love is all about finding the right chemistry. So it’s not really surprising that the red beauties in the Amelia Ring were born in a lab and created with the vital elements of every timeless love story. Heat. Chemistry. Romance. Our Scienza® rubies are scientifically-grown using precise equipment that re-creates the high pressure and heat that nature uses to produce gemstones far beneath the surface of the earth. These Scienza stones are chemically identical to the natural gemstones and display a better color and sparkle than most mined stones without the enormous price tag. The Amelia Ring features over two carats of Scienza rubies and DiamondAura® in an exquisite vintage-style setting. The transparent color and clarity of DiamondAura emulate the most perfect diamonds (D Flawless), and both of these stones are so hard they will cut glass. 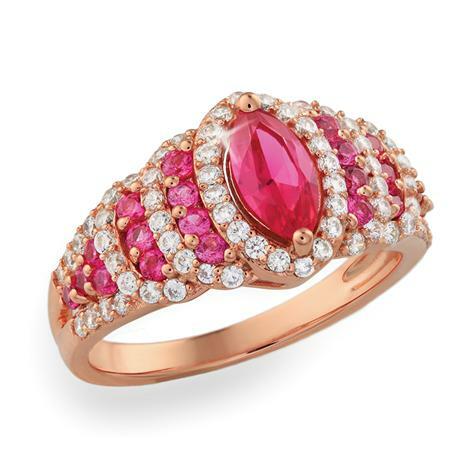 This ring radiates romance and elegance. Now, get ready to crank up the heat.